A 1500+ employees company is trying to be greener and instead of throwing cardboard packaging out it sends it for recycling. Recycling company won't accept less than several dozen kilograms of materials and also driving small portions of this waste very often is not economical. So the waste has to be stored for a while. The problem is corrugated cardboard (the most typical in packaging) occupies a lot of space even after the original boxes have been "disassembled" and became just pieces of cardboard. I imagine there're some industrial machines which can tear the cardboard into pieces and maybe even compress it into pellets but those would likely be uneconomical with this scale. Is there any easy way to preprocess cardboard that comes from packaging so it can be stored in a more compact way before it is recycled? 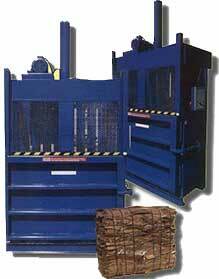 Most places that generate a lot of cardboard (grocery stores, Costco, etc) seem to use a cardboard "baling" machine -- this machine will compress the cardboard and strap it to hold it together. You can often see the bales of cardboard behind the store or on their loading dock, awaiting pickup by a recycler. I'm not aware of any commercial machine that shreds into pellets and compacts the cardboard pellets for recycling, that would probably be more difficult to store and transport since it would have to be placed and compacted into containers while baled cardboard is a self-contained unit that needs no special container. Good for the company that's greening-up their processes! The greenest options are to Reduce the stored amount (ordering less) or facilitate Reuse (i.e. package outgoing items; set up a box pickup for employees; list boxes for giveaway on a specific date using Craigslist, Facebook ReuseIt groups or Freecycle). I get a lot of deliveries & once a month take less than 10 minutes to list our items & another 10-15 minutes a day later to handle replies & pickup arrangements. The takers come pick up our boxes & packing materials a day or so later. You have more options for Recycling, too. A couple of small businesses near here made ongoing arrangements with small farmers to pick up boxes on set days, for their compost piles and/or soil revision. Any or all of these would empty your space out more often with minimal effort. For any cardboard that's still designated for storage & bulk recycling you might decrease the volume & make compacting easier by shredding it. I don't know if this takes a special shredder but one business we know that does this is Bulbs.com- I know because they use those along with newspaper shreds as packing material for our bulb orders. (I don't work for or with them- we just order their bulbs.) The strips make fantastic cat toys & activity piles, so they're very popular deliveries at our house! When the cats are done with them we add them to our compost pile. Not the answer you're looking for? Browse other questions tagged recycling cardboard storage or ask your own question.